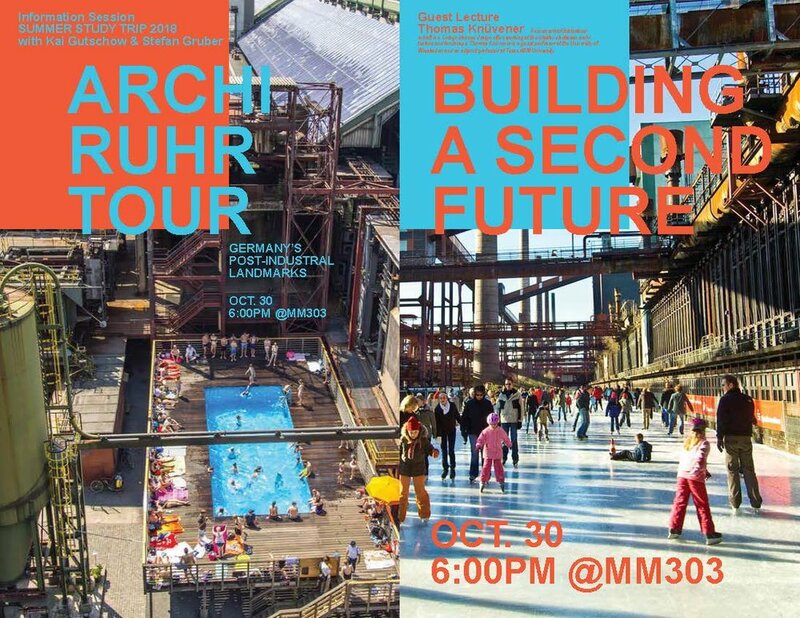 On Monday 30 October at 6:00pm in MMCH 203 following the ASO studio presentation, Kai Gutschow and Stefan Gruber will host a first information session for the summer study trip to Germany: The Archi-Ruhr-Tour to Germany's Post-Industrial Landmarks. As part of the evening, Cologne based landscape architect Thomas Knüvener will give a guest lecture and some insights into "Designing a Second Future." Thomas Knüvener is founder of Knüvener Architekturlandschaft, a Cologne-based office working at the interface between architecture and landscape design. He is a guest professor at the University of Wiesbaden and an adjunct professor at Texas A&M University.